Cut the apples into small cubes, stew lightly with a dash of cinnamon. Drain stewed apples, mix with one can of cherry pie filling. Warm the mixture in a saucepan or in the microwave. Open your second can of cherry pie filling and lift out cherries. Set the cherries aside for garnish. Cut a thin orange peel strip from your navel orange peel – making the strip as long as possible – set aside. Warm your Kontos French-style crepes in a lightly buttered skillet for one minute each side. Lay each crepe flat. 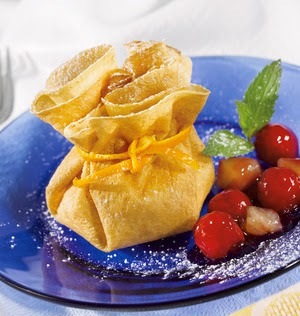 Arrange apple-cherry filling in center of crepe and bring up edges of crepe to center. Pick up edges of crepe, twist gently to enclose filling. Tie the orange peel strip around the crepe to form a purse. Sprinkle with powdered sugar; garnish with four or five cherries and mint leaves. I love the combination of apples and cherries, but Imthink I would add some fresh cherries to cook withthe apple stew mixture.